It’s been soup weather ever since I got back from warm, sunny Florida early Monday morning. It was a bit of a shock coming back to freezing temperatures, but I’m not really upset because I love this time of year; cold temperatures and all. I love mittens and sweaters, hot cups of coffee and sitting by the fireside. It also happens to be the holiday season, and I have yet to meet someone unhappy about that! Last night the temperature dipped to just below 20 F here, warranting a hot bowl of soup for dinner. 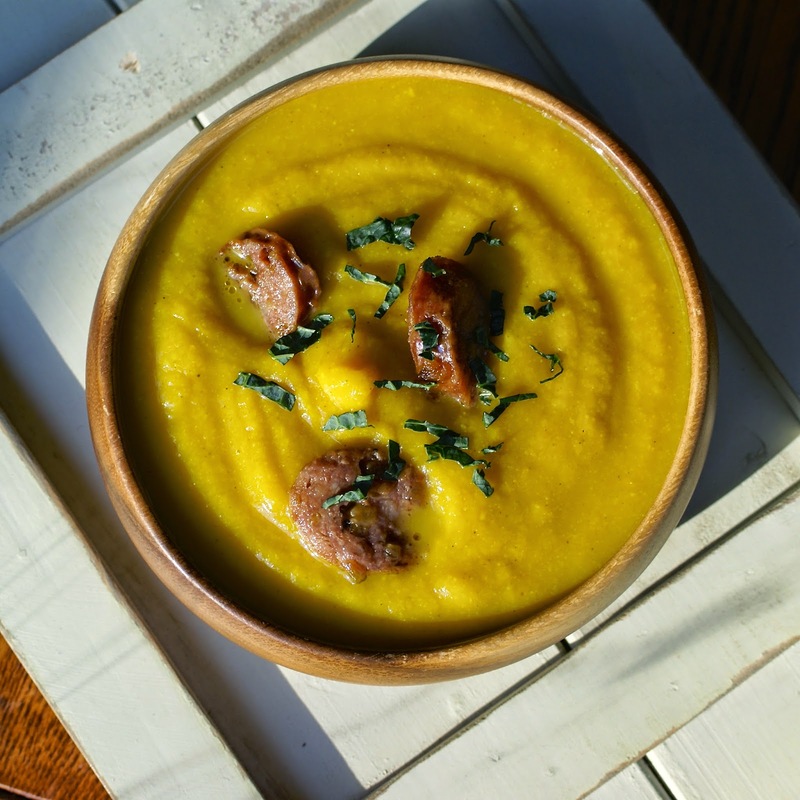 My Aunt Barbara grew the blue hubbard squash, while my Aunt Rho grew the carrots used in this soup. I love when I know where my veggies come from! But let’s back up. What the heck is a blue hubbard squash? Blue hubbard squash are shaped like a giant, bumpy lemon with a blue/grey exterior. When I say giant, I mean these squash can reach anywhere from 15-30 lbs! Whenever I get my hands on one of these squash I really have to plan out what I’m going to make with it since once roasted, there is a lot of squash to use up. To cook these large squash I just throw them in the oven whole on a rimmed baking sheet at 350 F and let them roast until its fork tender. I then easily slice it in half and scoop out the seeds and flesh. Due to the size, cutting these squash raw is nearly impossible. I’ve taken a hammer to these beasts as well as throwing them on my deck from a chair to break them open. Let’s just say roasting whole is the answer. The flavor of the blue hubbard squash is a cross between a pumpkin and a butternut squash. They are delicious, buttery smooth vegetables that can be made either sweet or savory. I went the savory route with some fresh carrots for a touch of sweetness as well as cauliflower for creaminess. Fresh ginger, cumin, allspice, bay leaves, and cinnamon sticks add flavor to the squash while I added some turmeric to enhance the yellow orange color (and sneak in some extra health benefits!). I paired this soup with apple-chicken sausage, but my apple-sage sausage or smoky tempeh bacon would be delicious as well. No matter how you top it, this is a warm, scrumptious bowl of veggie bliss. 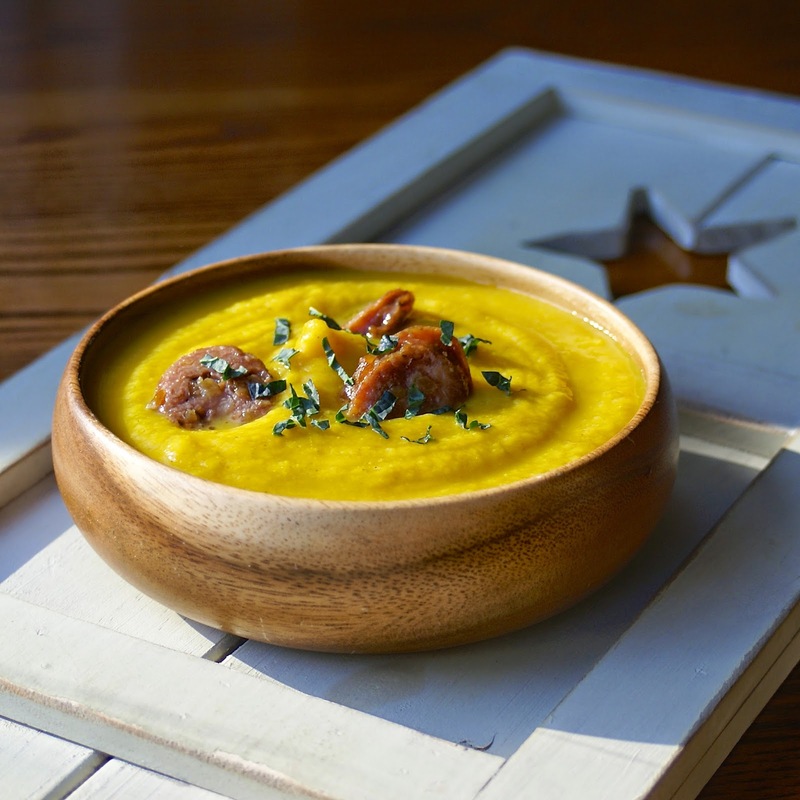 Eat seasonally and try something new by making this spiced blue hubbard squash soup! * You can replace the hubbard squash with pumpkin or butternut squash. ** The amount of salt needed will vary depending on the sodium content of the broth you use. 1. Heat the oil in a large pot over medium-low heat. Add the onions and saute for about 10 minutes, or until translucent. Add the garlic and ginger. Cook another 30 seconds, or until fragrant. 2. Add the carrots, cauliflower, cumin, allspice, and turmeric. Stir to evenly coat the spices over the vegetables. 3. Pour in 6 cups of broth and add the cinnamon sticks and bay leaf. Bring to a boil, then simmer for 20 minutes with a cover. 4. Remove the cinnamon sticks and bay leaf and add the roasted squash. Using an immersion blender or food processor, blend the soup until it is velvety smooth adding more broth as needed. Taste and season with salt.